Email marketing, like most all things, can do some amazing good... or irreparable damage. Email marketing lets you build relationships with leads and current customers. Customers have even said that they like email marketing more than a regular email. Not only are they a customer favorite, but they also are more effective. The emails sent by email marketing are usually beautiful. They're gorgeous to look at, so you'd think they'd be more likely to be read. Well, yes and no. 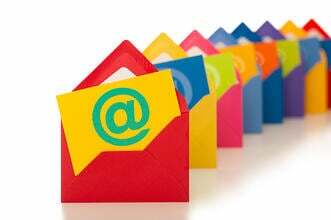 Email marketing is good, but only to a certain extent.. So, how much email marketing is too much, and how can your business avoid getting on customers' black lists? Email marketing is effective, but if you send too many emails, the effect will be catastrophic. A new study found that 75% of recipients will resent a company that bombards them with email marketing. Try to limit your email marketing attempts. Make sure you have something to say before you send the email, and put yourself in the customer's shoe. If you got this email, would you open it and be delighted, or delete it and be annoyed? Don't send unsolicited emails; if the person or company hasn't given you your email, don't add them to the list. Personally reach out first, and then think about email marketing. Again, 71% of email marketing recipients say they resented a brand they didn't give their contact info to. Also, getting the gender or name of the person wrong is not only annoying, but it also tarnishes your business reputation. If you're in public relations, you're supposed to know your audience. What does it say about you and your brand if you can't even get the person's name right? Talk about a major slap in the face! One of customers' biggest complaints about email marketing is that often times the content can be really confusing. To avoid this negative reaction, be sure to write your email as you would a press release. Make sure your purpose is clear, and arrange your content in a logical, simple manner. On this note, be sure your headline entices the reader to open the email. Subject lines seem like a small part of your job, but in actuality, they matter more than anything else! Email marketing should be specific. It won't be productive to send the same email to prospective clients, current clients, consumers, and B2B connections. Rhetoric is our friend in public relations, so don't forget it! Identify a clear reader for each email you send. Use different jargon, write about important issues for the specific audience, and do your research! You've come this far; don't stumble before you reach the finish line. Email marketing has a ROI of $40 for every $1 invested. Plus, email marketing is expected to keep growing. Over the next five years, email marketing is predicted to grow 10% each year. This is not a trend that's going away! It makes an impact when done right, so go ahead, follow our tips and see your clientele expand! One of our favorite ways to use email marketing is to launch a new product. Learn more expert tips with our "Launching a New Product" E-book below! Could it get ANY easier? !